It seems that photographers have already forgot the DO technology. Perhaps some of my blog readers do not even know what's this. But last October, at Photokina 2014, Canon surprised us with the presentation of a new 400mm f: 4 telephoto lens of only 23 cm long and two kilos of weight. 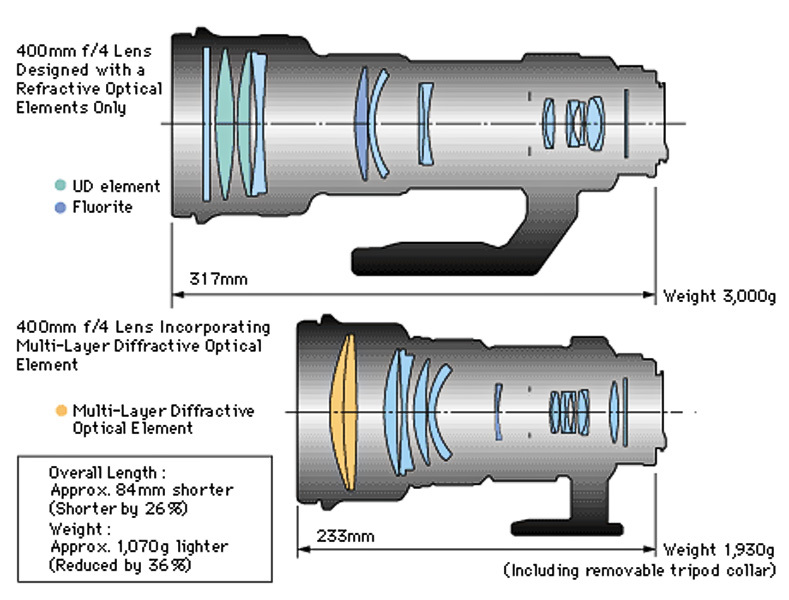 Specifications much lower than those of a telephoto designed with the conventional optical technology. However, this gem is the remake if we use cinema terms, of something that was revolutionary in its day, something that could have been a hit with nature photographers, but unfortunately it was not. Let's go back thirteen years ago. 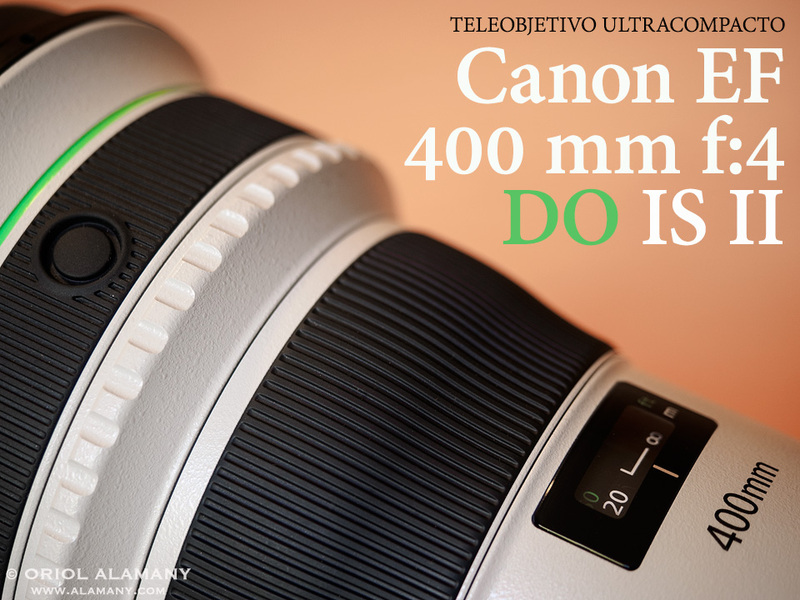 When in December 2001 Canon made the announcement of the original Canon Lens EF 400mm f:4 DO IS, I thought that from Japan they had heard my most secret desires. At that time most wildlife photographers were using 500mm f:4L telephoto lenses of about 40 cm long and weighing between 4 and 5 kilos, or some of them 400 mm f/2.8 or 600mm f/4 which exceeded six. Walking or carrying any of them when traveling or climbing the mountains was (indeed, still is) an ordeal. And with such large telephoto lenses, shoot handheld photographs is difficult and follow the rapid movements of some birds in flight almost impossible. At that time, the smaller or less heavy alternatives that allowed greater mobility were either the already old Canon EF 400mm f:5.6L (unfortunately without Image Stabilizer IS), or the first version of 100-400mm f/4.5-5.6L IS that was not excellent at 400mm. His second updated version has just been also presented by Canon at Photokina, although both have a limited maximum brightness of f:5.6. So when in 2001 I saw the announcement of the 400mm f/4 DO, more compact than a 300mm f/2.8 and almost half the weight of a 500 mm, this seemed to me the ideal lens to carry around the mountains looking for wildlife. To accomplish this feat of the industrial design Canon engineers had put inside this telephoto a special lens made of synthetic material (Fresnel Diffractive Optic or DO) based on the ones used by laser CD readers, the lighthouses, or the flash extenders. This allows shortening the total optical length as well as greatly reduce their weight. 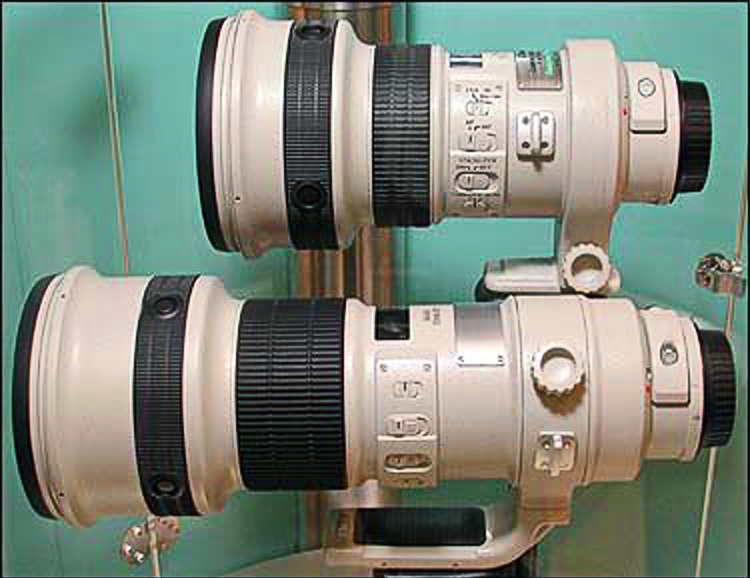 The Canon EF 400mm f/4 DO IS version I from 2001, side by side with the prototype of an hypothetical EF 400mm f/4L IS with conventional optical design that was never manufactured, but Canon showed at photography trade shows Canon for comparison. However, the technology was not well developed yet and that 400 mm had an excellent resolution whenever you closed the aperture a little bit (f:5.6). At f:4 it had low contrast and although it was possible to improve it by post-processing, the image quality was somewhat compromised. In 2004 I had the opportunity to try one and the side by side photos I did with my 500 mm convinced me that dreams are only dreams. It was not a bad lens, but as you needed to work as often as possible at f:5.6, there was the super manageable 400mm f:5.6L, which also did not have a such exorbitant price. Some photographers assert that after a certain year, the specimens that left the factory offered improved performance. But it was to late, the bad reputation accompanied this telephoto until the end of his days. Moreover, the inclusion of the DO lens engraved with concentric rings was responsible that some users complained of the unusual glare and bokeh of this lens. So the years went by and it was sad to see that such a lens specifically designed for us, the wildlife photographers, was used by almost nobody. For professionals it did not provide the utmost quality of other L series telephoto lenses, and for most of the photo amateurs the price was unattainable. 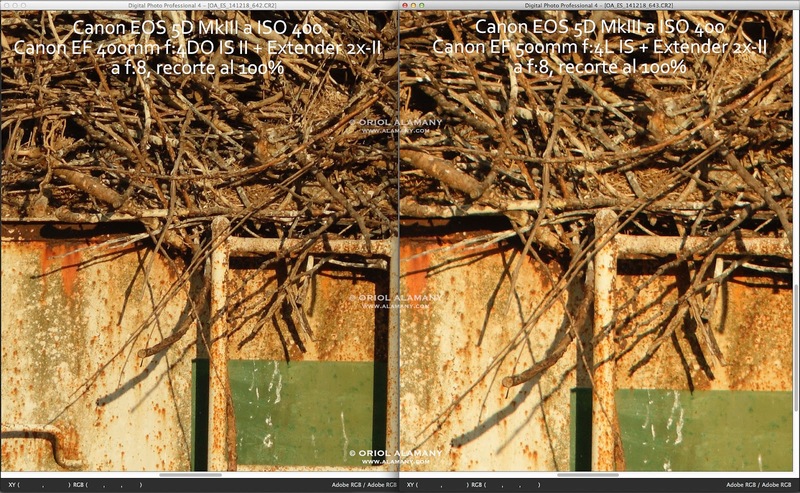 Canon made another attempt of DO lens in 2004 with the tiny 70-300 mm f:4.5-5-6 DO IS that neither had much impact. Photokina 2014: big surprise in the photography show. 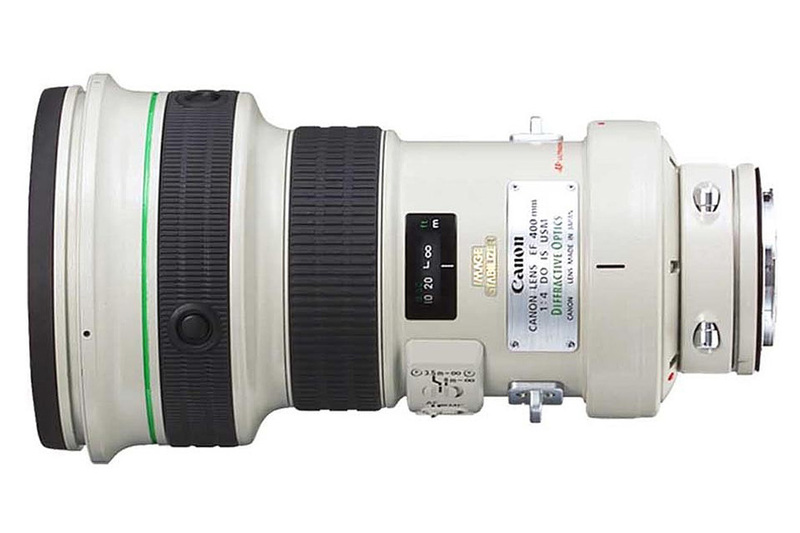 Canon announces the version II of this telephoto lens. Something that nobody expected, not a single rumor had spread online. It was the show of second versions: new 100-400 mm L IS II, new 400mm DO IS II and new model of 24-105 mm. - New optical formula with 18 elements, combining a third generation DO lens with aspherical lenses and a magnesium alloy body for compact size and light weight. - SWC lens coating that reduces glare and reflections as well as fluoride who makes easier to clean the dirt from the outer lenses. - Latest generation 4 steps Image stabilizer (instead of 2), and with Mode 3 for tracking subjects with irregular movement. - Minimum focusing distance is now 3.3 meters instead of 3.5 (Too bad that Canon has not been able to achieve a shorter distance for photographing small birds, lizards or butterflies). Using the Canon 25mm extension tube the focusing distance is reduced to 2.36 m.
- Power Focus silent focusing for shooting video. - Weight is now 2,100 grams. A little heavier since version I was 1,940 grams. If we add the lens hood (manufacturers never include it in the weight published in their catalogs), the total rises to 2,275 gr. - Measures: 12,8 x 23,3 cm. 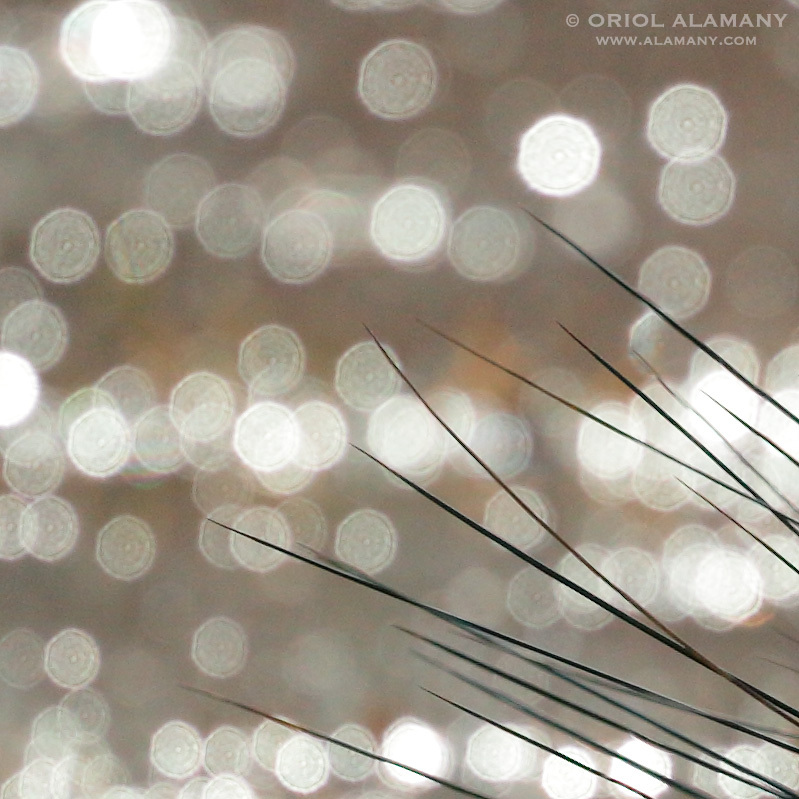 - Nine aperture blades instead of eight, for better bokeh in the background blur. - The DO element is now positioned deeper within the telephoto to minimize reflections. For a few days I could use this telephoto thanks to a loan from Canon Spain. When I received the box at my studio I had not yet seen a single test of this lens, so I felt somewhat privileged. It was love at first sight. Just opened the small suitcase and grabbed my hands on it I appreciated his excellent finish, design and lightness. Well, relative lightness, as they are two kilos, but for someone used to work with a telephoto of more than four kilos, everything seems lighter. Putting it in the table next to my usual 500 mm was a revelation.What a difference size and weight for a so similar focal! 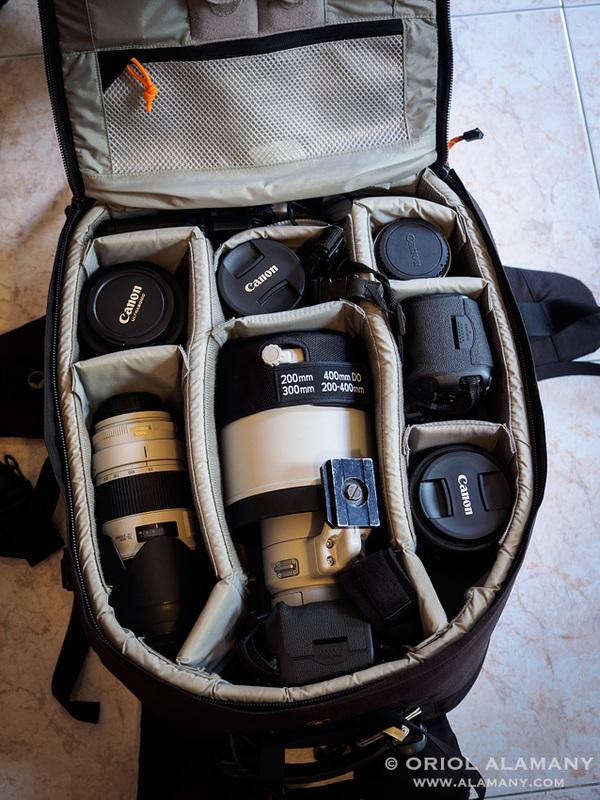 Usually all the center area of my Lowepro backpack is full with a 500 mm. With the shorter 400 DO, you win space for other lenses or accessories. Or you can buy a smaller backpack! Then I made some first shots from the window for a quick comparison with my 500 mm and I saw with surprise that the results were virtually identical. It was not very optimistic about that lens given my the negative experience with the first version, but my reluctance collapsed immediately. Now I had to try it on the nature! 100% crop comparing the optical quality with an 1.4x teleconverter in the 500 mm f/4L IS and 400mm f/4 DO IS II (Click to enlarge actual size). (The text of this photograph has a mistake, because although the telephoto works at f:4 actually the functional aperture is f:5.6). 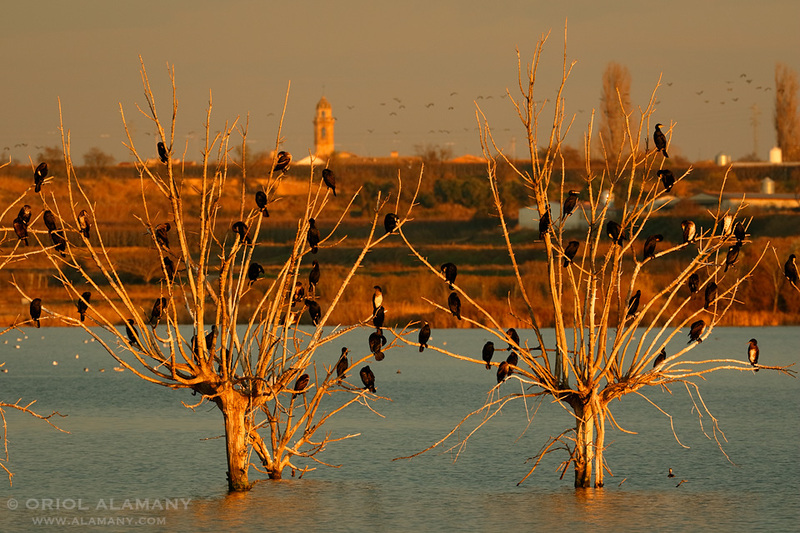 After a morning doing various tests in the hides of Llobregat delta near my home in Barcelona (Spain), then I traveled to the Ivars lake in Lleida. 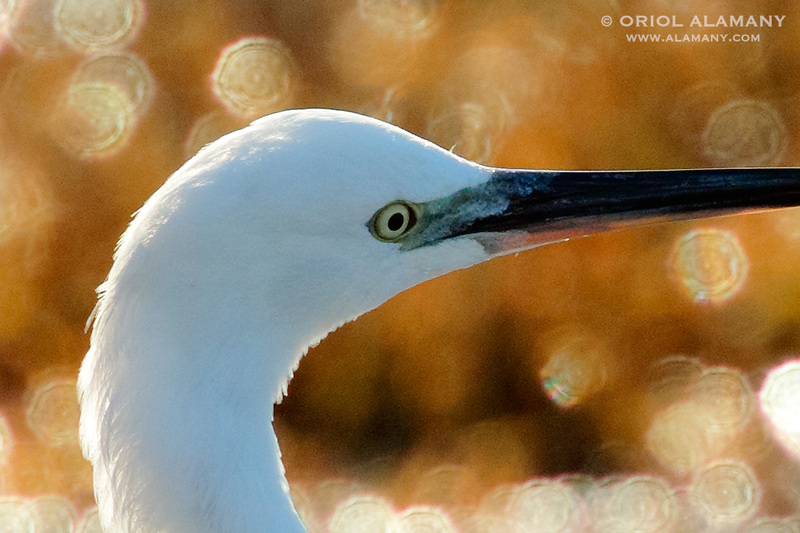 The first afternoon I walked around the wetland, stalking with the telephoto on hand. Its portability is great and allowed me to move freely photographing several species of birds and following rabbits. 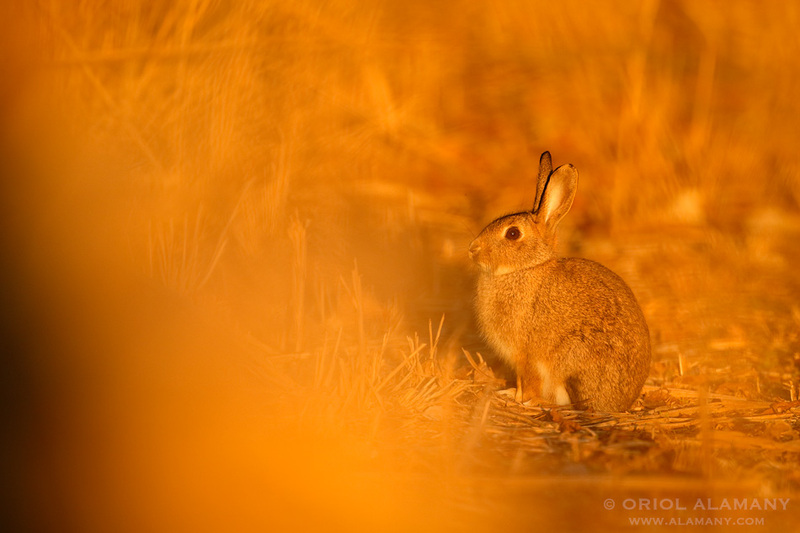 Common Rabbit at sunset on the shores of Ivars lake. 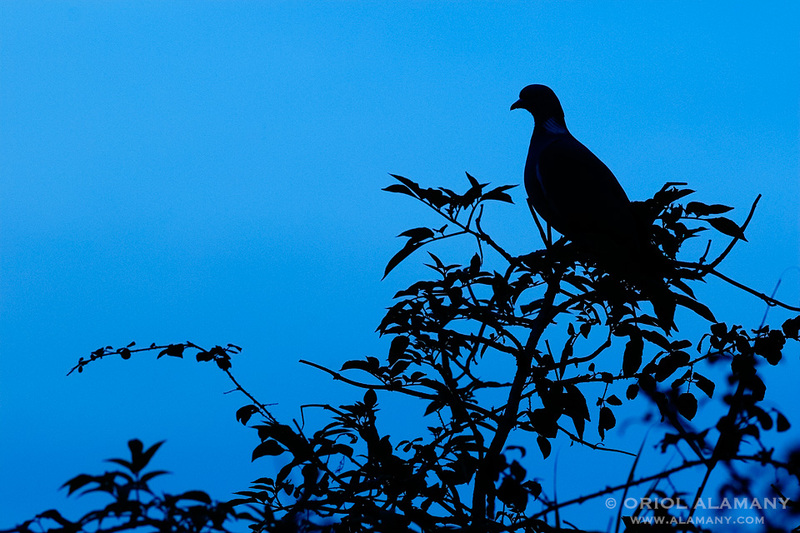 Woodpigeon at dusk in Ivars lake. After a short sleep, the next morning Roger Santmartí from Photo Logistics took me to one of the hides that his company manages at this wetland. 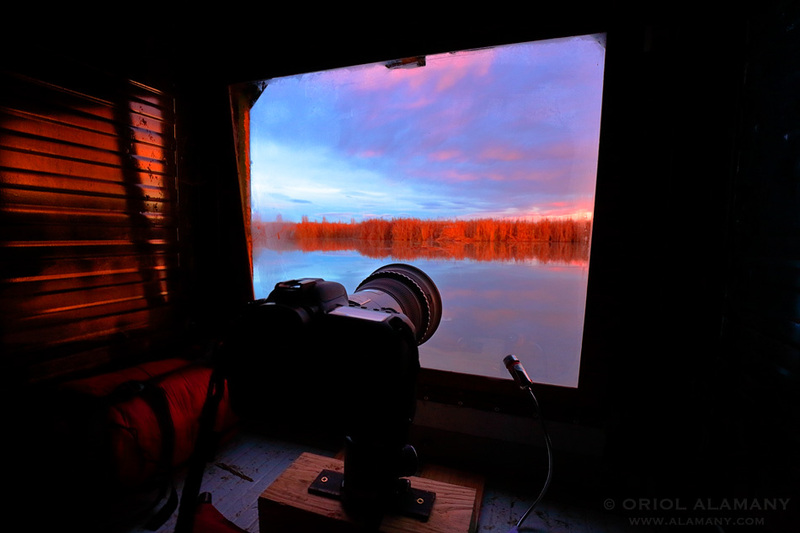 It is a flat hide located at water level where one can photograph a diversity of waterfowl with a nice very low viewpoint. 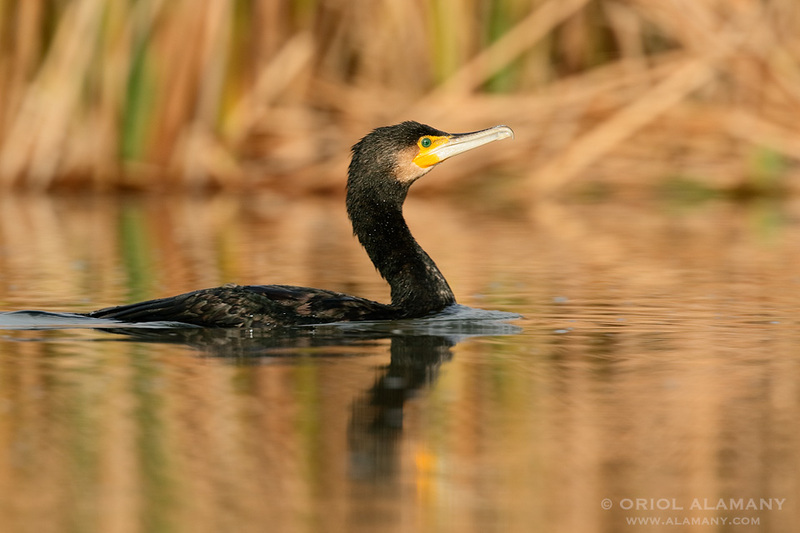 There I settled in the company of 400 and 500 mm, my 5D Mk III camera and another loan, the new Mk II 7D. And also a thermos full of hot chocolate that helped me pass the long and cold hours stretched. Working with the 400 mm DO II inside de hide from Photo Logistics in Ivars lake. After using this telephoto for a few days I think there is no better way to sum up the experience by saying that I would not mind at all that this lens was part of my professional gear. Using it is a joy. 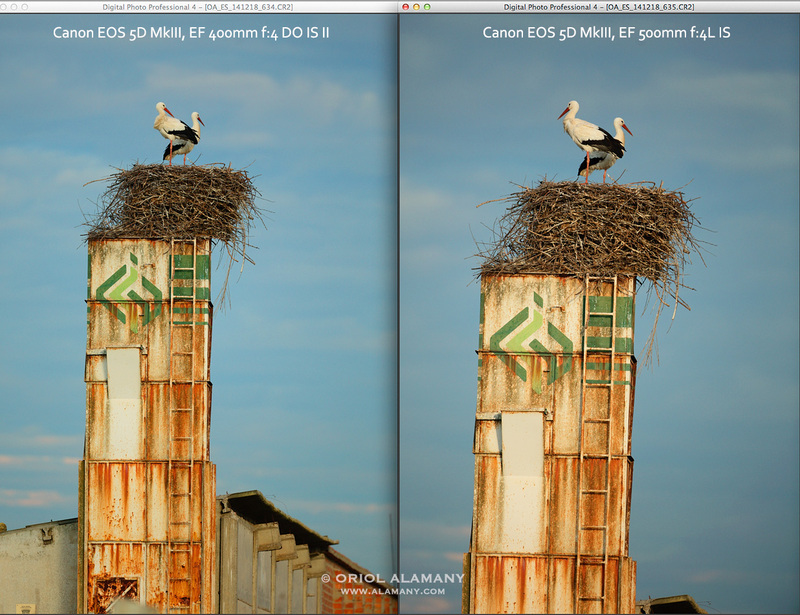 Regarding the 500 mm f:4L IS which I usually use the difference in size and weight is very noticeable. 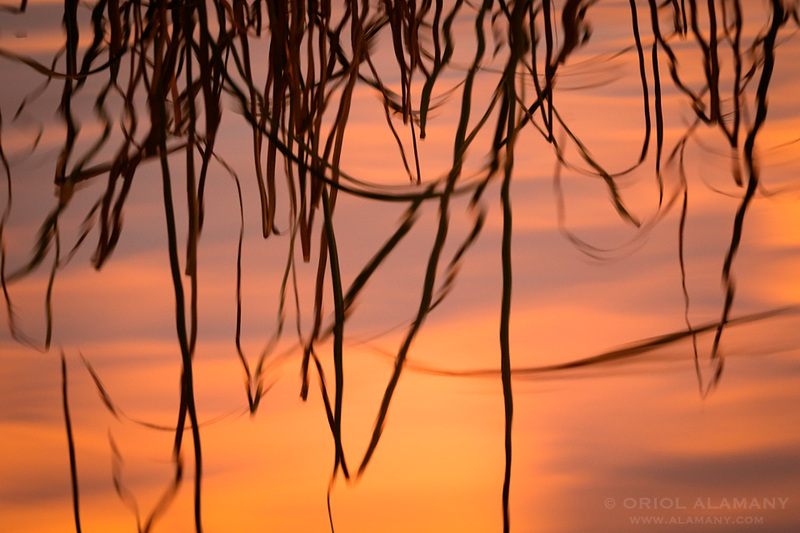 Two evenings carrying the camera and telephoto on my shoulder, walking around the wetland, was a very different experience to do it with a 500 mm. The lens is very usable without any tripod, handheld. And it's not just the weight, it's also the absolute manageability to easily capture birds in flight very quickly. 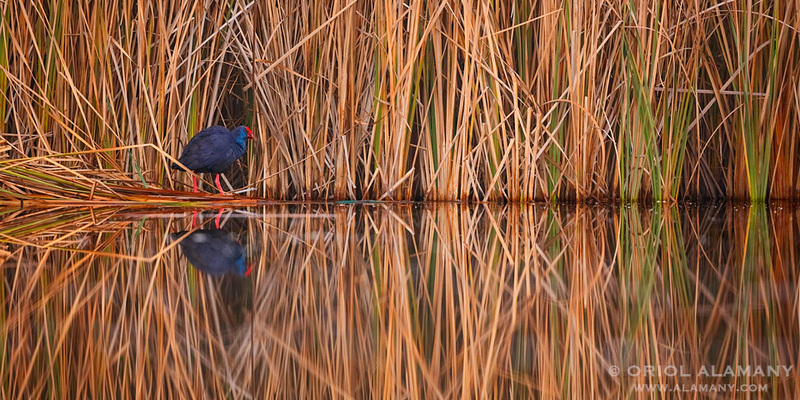 Purple Swamphen at dawn on Ivars lake. 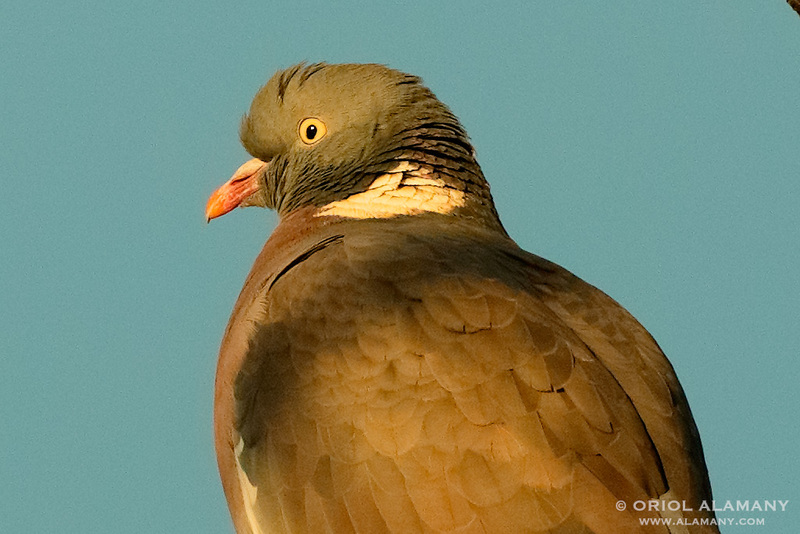 It is true that we obtain less magnification by using a focal length of 400 mm instead of 500, but not too much. I saw that the 400 makes a perfect tandem with the Canon EOS 7D MkII, as the APS-C sensor provides an additional increase of 1.6x (equivalent focal length 640 mm). - Significant improvement on the resolution and contrast to the original version of 2001. Already excellent from its maximum aperture f:4, that in wildlife photography is the most used. Not necessary to stopping down to enhance the image quality. Absence of chromatic aberration. Fully comparable to the famous Canon L-series telephoto lenses. - Excellent behavior with the 1.4x and 2x teleconverters, resulting in a 560mm f/5.6 and 800mm f/8 of good quality (or equivalent to 900mm and 1280mm on an APS-C sensor). - Impeccable and robust construction, of the same style and professional level than L series lenses, sealed all-weather protection. - Internal, fast and silent ultrasonic AF. Manual focus ring remarkably accurate and pleasant to touch, a pleasure to use. - Four steps IS, silent and without jumps as older versions. 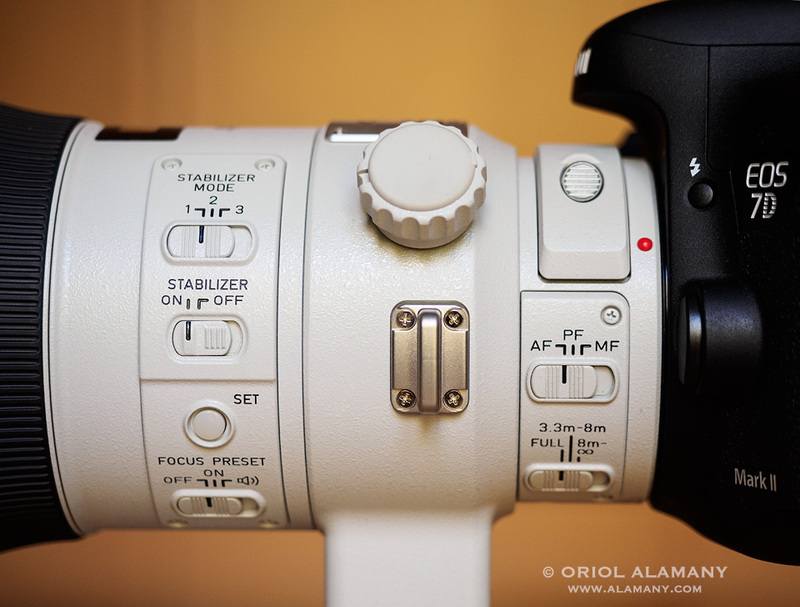 - Accepts 52 mm filters in a back box, you can even use the specific polarizer. - Precio elevado, pero algo más comedido que la antigua versión 1 (6198 € contra 6455 €) y menos que un 500 mm (8374 €). - Expensive, but not so much as the older Version I (€ 6,198 to € 6,455) and less than a 500mm (€ 8,374). (Prices in Spain, January 2015, 21% VAT included). 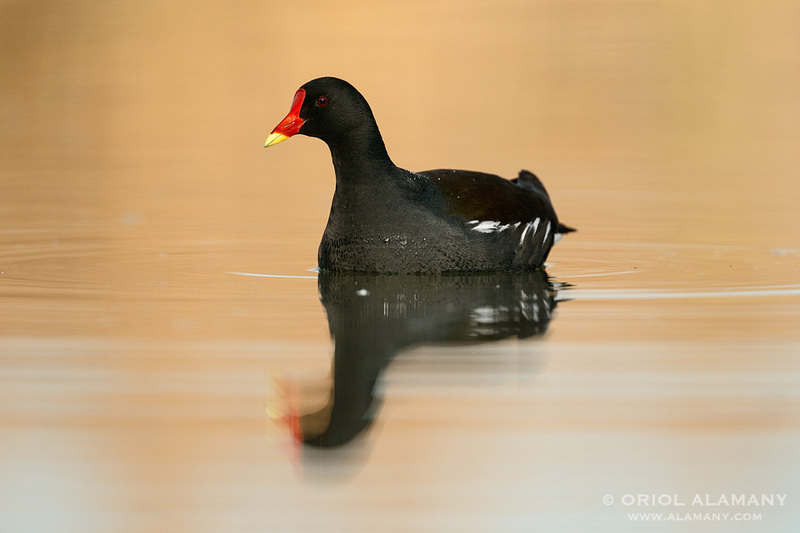 Common Moorhen in Ivars lake. 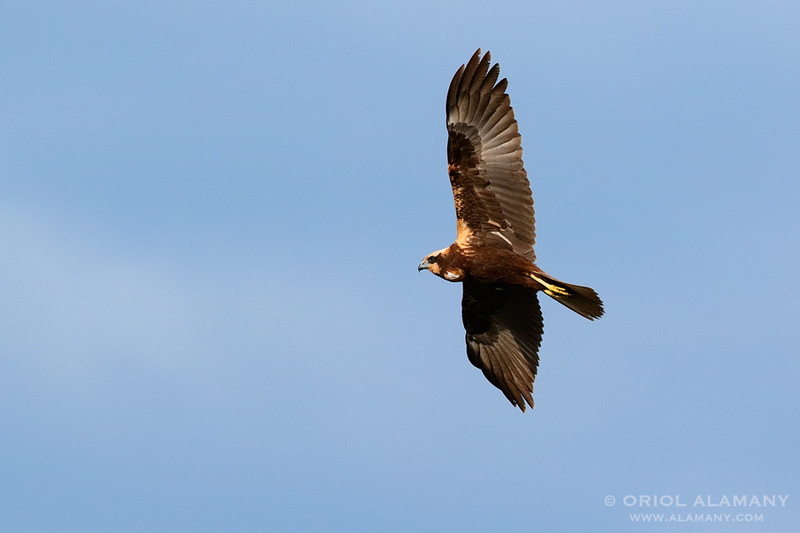 Western Marsh-harrier flying over Ivars lake. 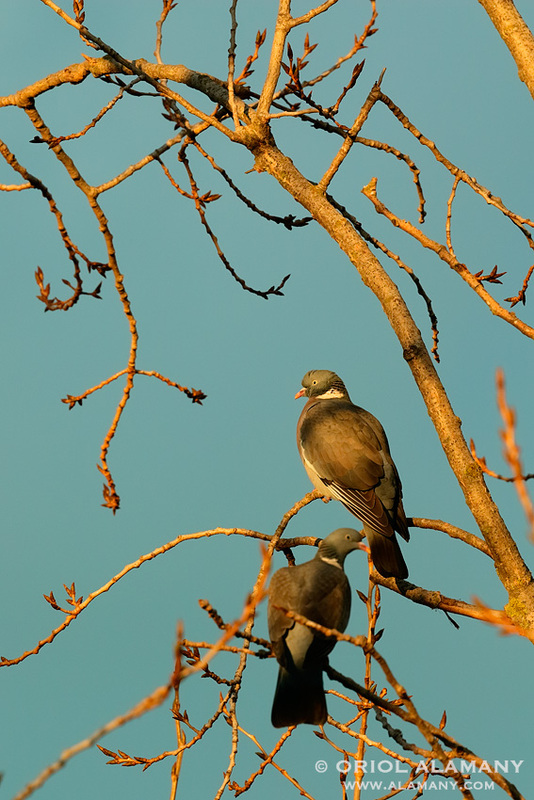 Woodpigeon at sunset in Ivars lake. 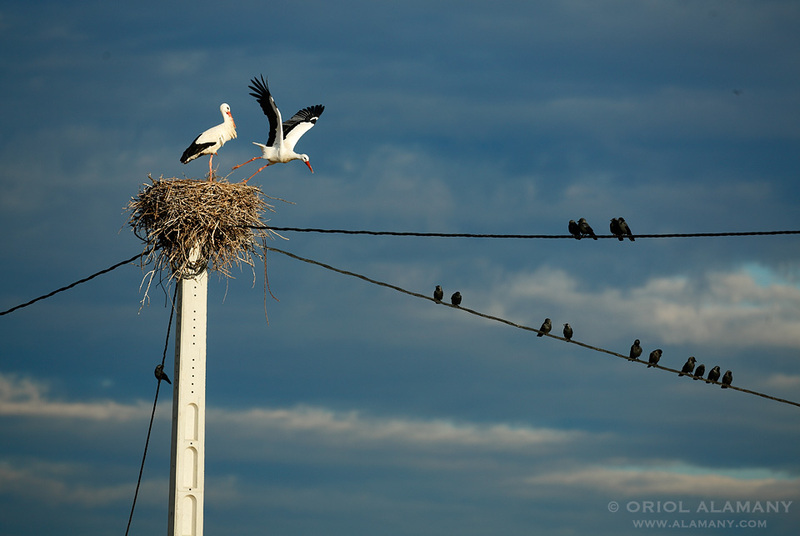 White Stork at the nest, Ivars. Good performance combined with 1.4X or even 2x teleconverters. I am aware that my conclusions may seem almost propagandistic, but this is one of those lenses that I fall in love and that after testing I was very sorry to return. But usually I am quite critical with any of the tools I use in my professional work, so I always find something that is not to my liking. 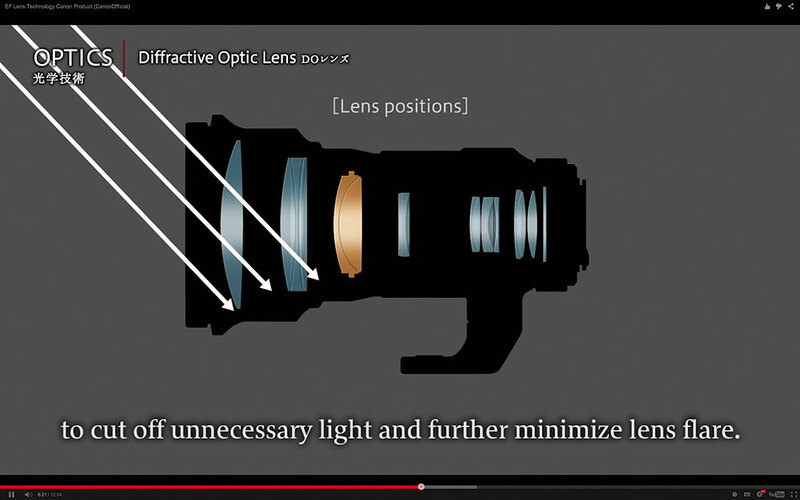 So I'm going to criticize something inherent to all lenses using Fresnel lenses or DO. The inclusion of the DO lens with concentric lines etched in its surface is responsible of the only problem, or should I call "peculiarity", of this unique telephoto. 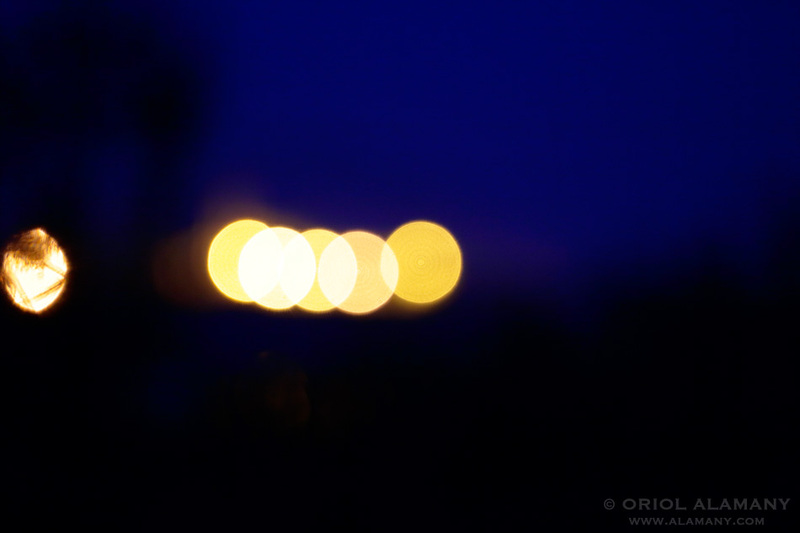 The way that, in certain situations, out of focus bright spots are reflected. The first version of the 400 Do was accused of producing strange halos and glare with out of focus spots shaped like onion rings. That issue seems to have been carefully re-examined in version II to avoid it. 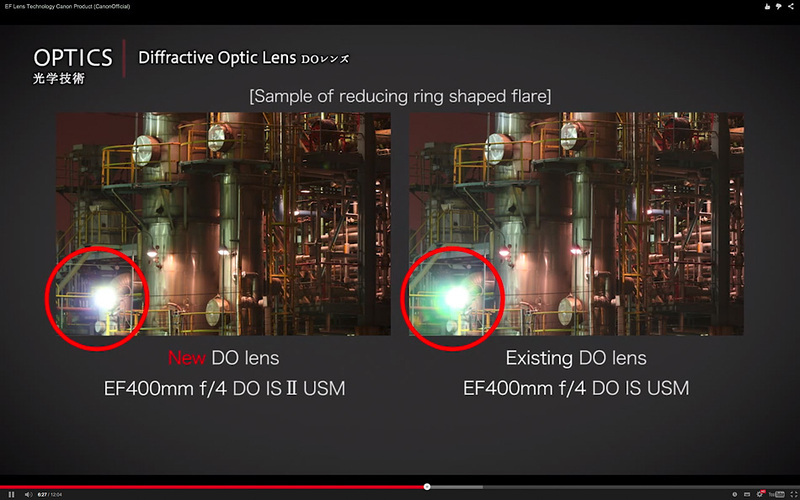 "To further prevent flare caused by light outside of the image striking the DO lens element, the placement of the DO lens has been optimised, by placing it deeper inside the lens and thus preventing stray light causing flare on the DO optic. Together with the third-generation DO lens elements, the high image-quality and reduction in size and weight has been made possible by combining this DO lens with a Ultra-Dispersion (UD) element and a large-diameter ground aspherical lens. As a feature of diffractive optics, sometimes you may see a flash (flare) colored around the light source depending on the shooting conditions. " In everyday use I have not appreciated any strange reflections or annoying bokeh. Canon seems to have done a thorough job in this regard. There is necessary to force the situation so that things start to twist. And I did it: I took the lens to the limit photographing specular highlights on backlit water or distant artificial lights. 100% crop 100% crop of backlit glare on water, where you can see the rings produced by the DO lens. In such cases flare formed by concentric rings may appear, but not always and not in a notorious way. It really depends greatly on the degree of the blur. Generally, when the background is more blurred the rings are less visible or disappear. I show here the worst cases, deliberately seeking to provoke this effect. In most of the pictures I made of subjects with backlit glare is not so obvious, and usually only noticeable increasing the image at 100%. If this peculiarity is sufficient or not to dismiss this DO telephoto is a decision each photographer need to make: the advantages of this singular optics are several, the potential problems just one. Distant lights of a town, intentionally blurred to cause glare. 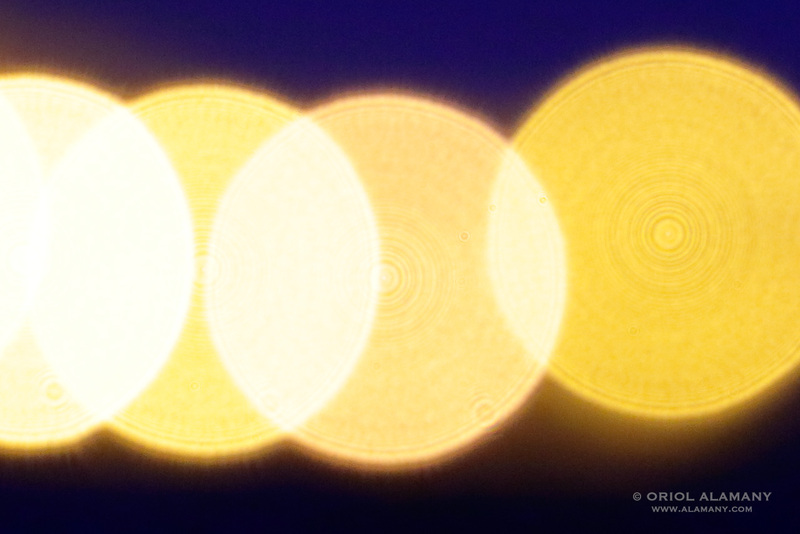 100% crop of the glare of the previous picture where the concentric rings produced by the DO lens are visible. In most situations blurring a little more or a little less and the rings disappear. 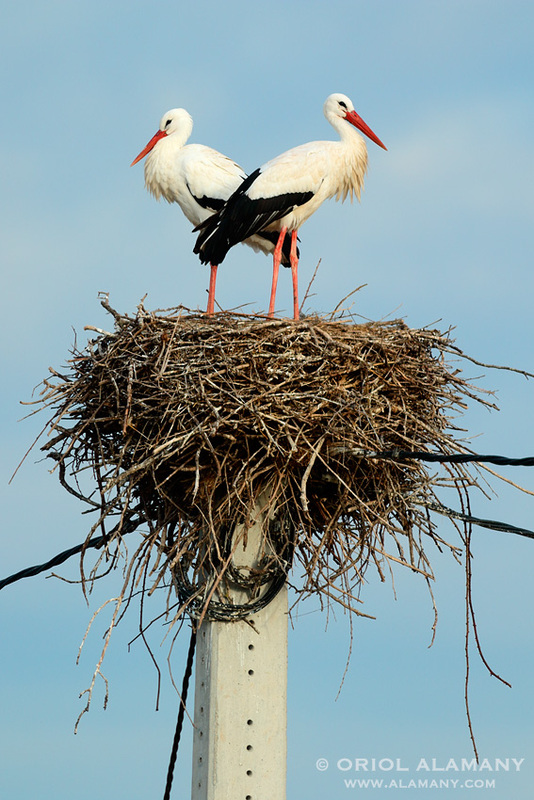 White stork nest on a farm, Ivars. 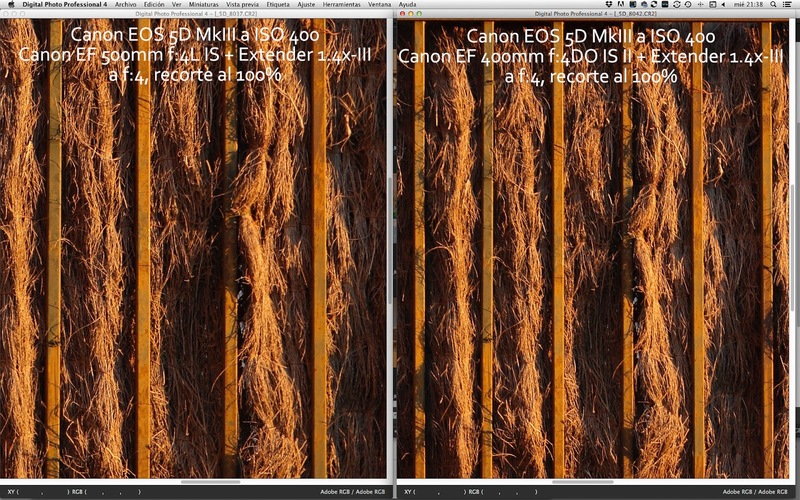 Here you can see the difference of magnification due to the increase in focal length from 400 and 500mm. 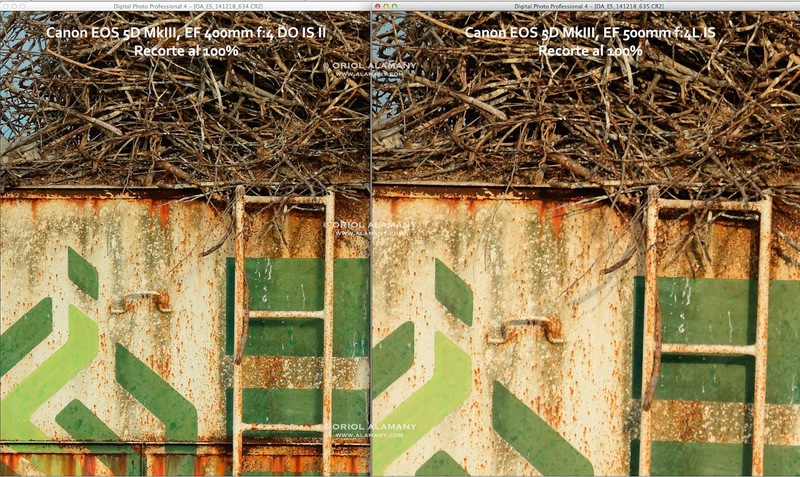 Slight color differences are due to a change of light between the two shots, not to the lenses. 100% crop from the previous photo (Click to see at real size). 100% crop from other pictures taken with the 400mm DO (Mk II) versus 500mm L (Mk I) with teleconverter 2x-II (Click to see at real size). 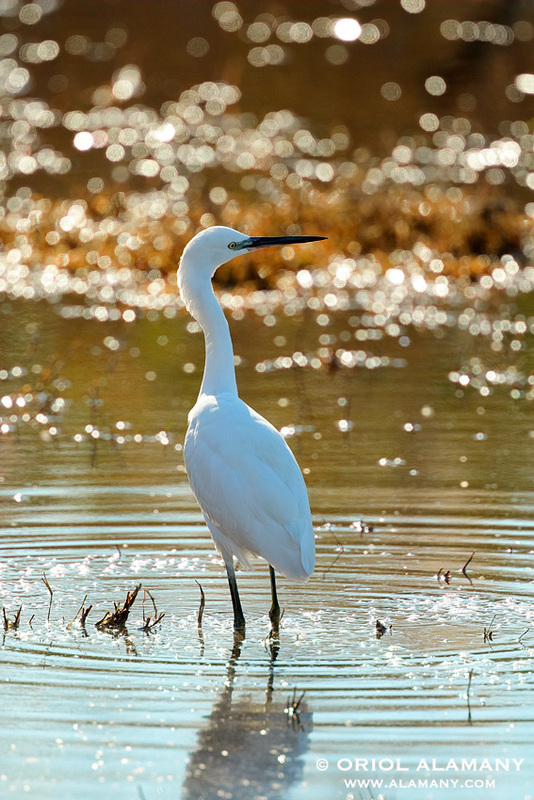 Canon now offers a lot of alternative telephotos for wildlife photographers. 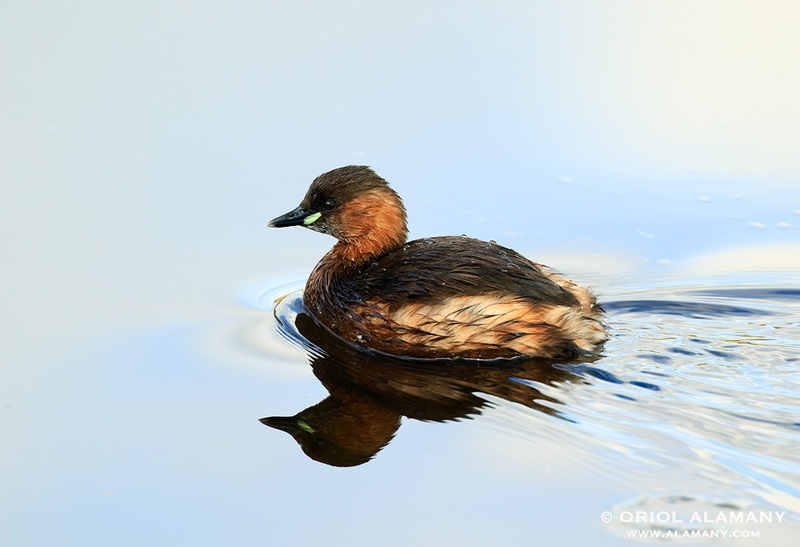 Between 300 and 600mm we have a wide range of focal lengths and apertures to choose. 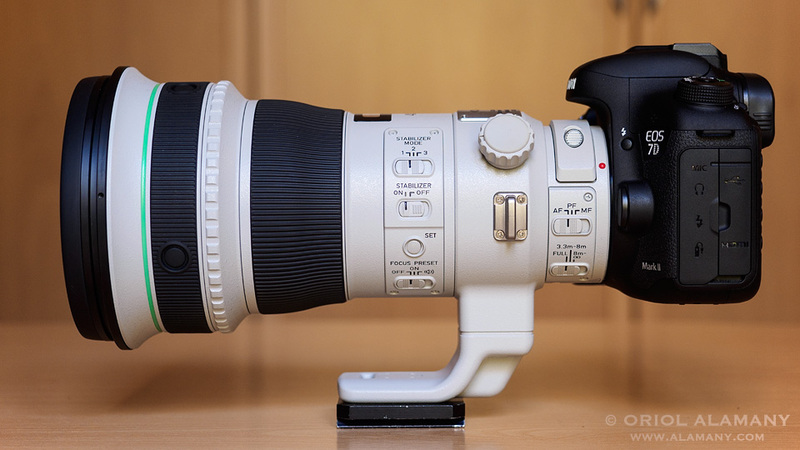 And now, this new EF 400mm f/4 DO IS II joined the crowd. Overall the 300mm are too short for the frightened wildlife that live in Europe, unless we use it in a camera with an APS-C cropped sensor. Or we accept to use it almost ever with teleconverters. In the latter case the 300mm f/2.8 is a good choice. Other continents may have more confident animals where the 300 will be more adequate. 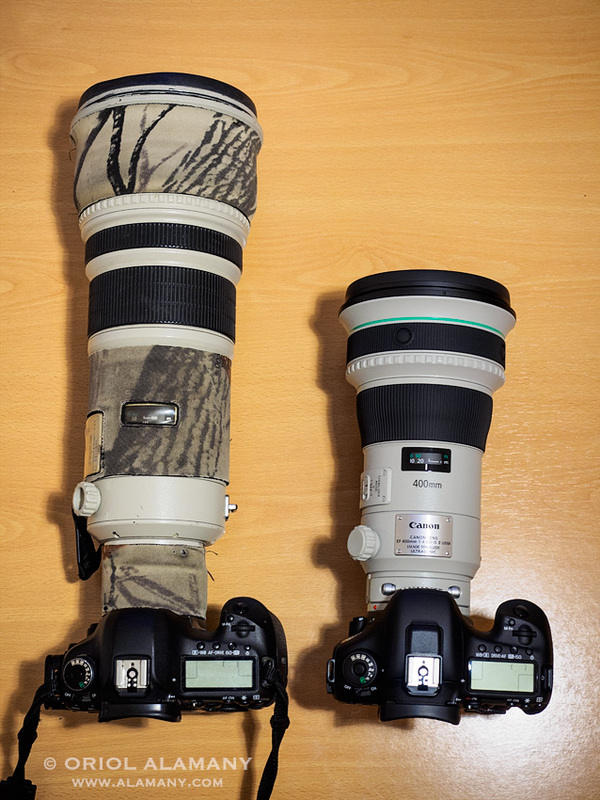 The 400 and 500mm f:4 are the telephoto lenses where magnification, weight and size combine better. 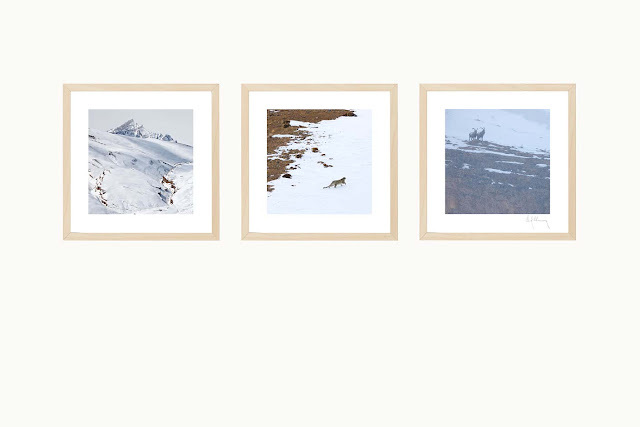 Therefore they are the most commonly used by nature photographers and are what I truly recommend. The less luminous versions f:5.6 are more portable and economic but we have to sacrifice brightness, while the bright 400mm f:2.8 soars a lot in price and weight. I think the 400 or 500 mm f/4 are the perfect middle point. With the 600mm f:4 we obtain a higher magnification that will be very welcome in Europe, but at a somewhat excessive cost and weight, only suitable for people with economic possibilities and if we do not have to walk a lot. Tamron and Sigma also offer some telephoto and tele zooms less expensive and generally less brighter than the I do not include here. 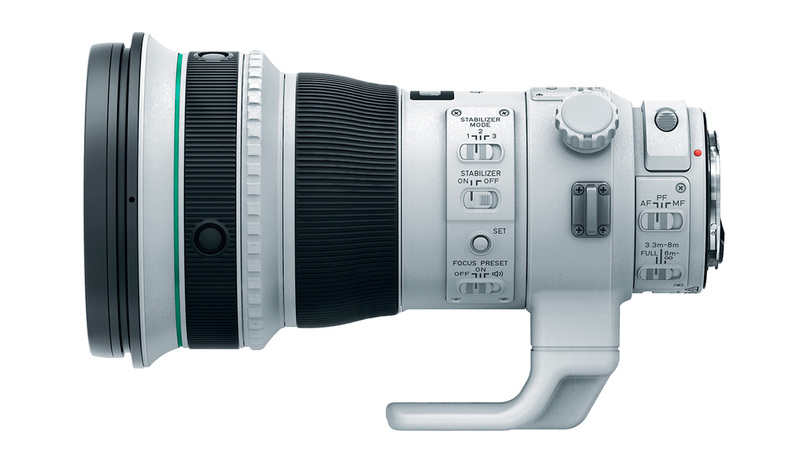 For its focal length, aperture and price this new telephoto Canon EF 400mm f/4 DO IS II is in the medium to high level end. However, in terms of optical performance clearly belongs to the highest class, with excellent resolution, being bright, but also very portable. This makes it ideal for action photography for both professionals and also prosumers who can afford the € 6,000 price tag. 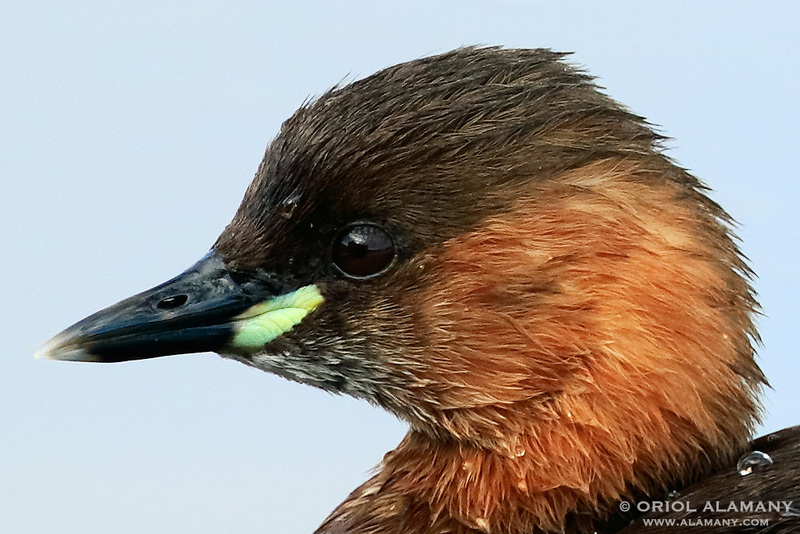 When deciding to purchase a telephoto lens for wildlife photography you should weigh the pros and cons that I have listed for the 400mm DO II and you can choose if that is your lens or not. I'm not an English person, so please forgive me the linguistic and gramatical mistakes. I have translated the original Spanish review due to the interest of several foreign photographers. Thanks to Canon Spain for the loan of this lens, even before its commercialization. 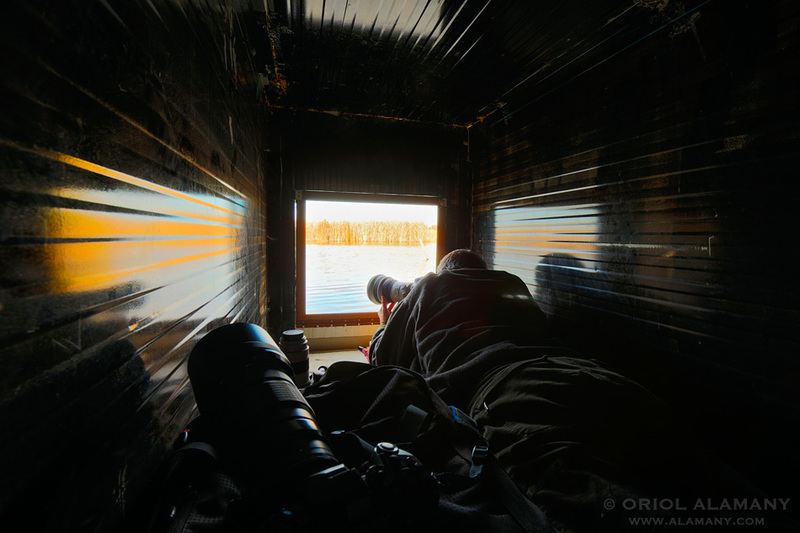 And to Photo Logistics for letting me use their hide in the lake of Ivars for a real test in the field. Canon Spain has loan this lens but without asking anything in return. My texts and conclusions are not in any way imposed by the brand. They are my personal observations and I publish it because I think it may be useful to other photographers. Already written this article and when it was almost ready to publish it, in January 6, 2015 Nikon announced its AF-S Nikkor 300mm f: 4E PF ED VR, using the same technology of incorporating a fresnel lens to the optical formula, here called PF (Phase Fresnel) instead of DO, getting a telephoto small and lightweight. Nikon himself recognizes the potential problems in glares due to the technology used and offers a solution to minimize through its Nikon software. It would be nice if Canon incorporate something like this to the DPP software. En l'últim apartat, el de Postscript tens el primer paràgraf repetit en castella iaugla qu el'últim que està en anglès. Suposo que anaves traduïnt fixant-te en lo que habías escrit abans i aquest no l'has borrat. Congratulations an awesome and well-detailed review based on your experience that we'll be useful for those of us that are not used to take pictures with these kind of lenses. Published a new lab test by Lens Rentals against the excellent 300mm f:2.8L IS II with and without 1.4x teleconverter, and against the 400mm f:5.6L. At full aperture the 400mm DO II is the best of all.